Maintaining cell viability throughout the cell culture process is virtually a nonissue in current drug discovery efforts. But with the move toward multiplexed assays, and industry’s desire for higher content without compromising throughput, it’s worthwhile to think of cell viability along a spectrum and to consider cell health and responsiveness in assay development, such that cells are appropriately responsive to what a given assay intends to assess. Informa’s recent “Cell-based Assays” meeting in Berlin focused on “novel advances in assay development to improve lead discovery and increase correlation to in vivo and clinical results.” This is, of course, a key ongoing concern for drug discovery research—to ensure, as much as possible, that the investments into screening stand a good chance of eventual clinical success. Marc Bickle, Ph.D., head of the HT technology development studio (HT-TDS) at Max Planck Institute of Molecular Cell Biology and Genetics, observed that basic culturing principles must be observed at all times. Speaking about phenotypic profiling of primary human macrophages in automated microscopy screens during mycobacteria phagocytosis, he noted that, with macrophages, monitoring healthy morphology is crucial to successful experiments. Poor cell health can create false positives, given that mycobacteria highjack cellular metabolism for their own survival. Dr. Bickle’s laboratory thus monitors cell health on many fronts. 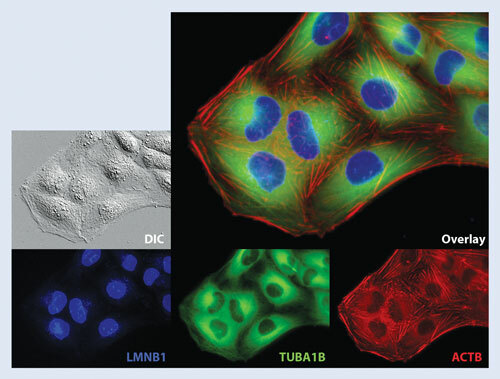 “For viability in highcontent screens,” he said, “images provide the easiest measure for detecting DAPI- or Hoescht-stained nuclei for simple counting” to monitor for polyploidy or micronuclei (indicative of carcinogenic or teratogenic effect or other disruptions of cell cycle) or measuring aberrant nuclear morphologies. His talk also covered mycobacteria survival measurement using high-resolution imaging on a PerkinElmer Opera System and monitoring of intracellular survival of Mycobacterium bovis, with simultaneous measurement of cellular responses of human macrophages. With macrophages, in particular, there is the technical challenge posed by the use of postmitotic cells. Given that they do not grow, change in the numbers of cells is not an assessment option, so it is essential to quantify morphology as a cell-health indicator using multiparametric image analysis. Also, for assays to be meaningful, cells must retain their responsiveness after preparative manipulations. Dr. Bickle described Cellectricon’s Cellaxess HT® as a game changer for research in his laboratory. Other systems his lab employed, namely electroporation in suspension or the use of shRNA, consistently caused cell death or macrophage activation, he reported. “With the Cellaxess system, the cells are perfectly happy,” requiring minimal manipulation with the automated platform that obviates both transfers to fresh plates and additional washings. Dr. Bickle stressed the importance of extracting data correctly from assay readouts, noting that it is important either to analyze signaling pathways in conditions of cell health, or if stress conditions are being studied, to understand the parameters of the stress conditions. Further, he highlighted that common assessments of cell health, such as doubling time, are in essence physiologically removed from clinical pertinence. Abhishek Saharia, Ph.D., product manager for functional genomics at Sigma Life Science, presented data on the company’s CompoZr® Zinc Finger Nuclease (ZFN) technology. The technology allows researchers to bypass the protein overexpression inherent in many assays that otherwise creates “a system that doesn’t truly resemble the patient,” Dr. Saharia said, given that such assays involve exogenous promoter systems. The ZFN platform comprises engineered DNA-binding proteins that induce doublestrand breaks in DNA at user-specified sites, stimulating natural DNA-repair processes. The end result is “precisely targeted genomic edits” resulting in cell lines (including somatic) with targeted knockouts and integrations, Dr. Saharia explained. Alternative systems may provide weaker data, he suggested, given that knockdown strategies are often partial and can lead to “incomplete effect.” Further, the ZFN platform enables the creation and assaying of robust human cell lines using any protein tag that has been endogenously incorporated into a specific locus of interest. Dr. Saharia offered the example of use of the technology with the epidermal growth factor receptor (EGFR) protein, tagged with GFP, at the endogenous locus. “The advantage is endogenous levels of protein expression, with complete responsiveness based on endogenous promoter systems and regulatory elements. This kind of targeted disruption may prove fruitful for advancing personalized medicines, Dr. Saharia further suggested, given that it permits live visualized tracking of small molecules that disrupt specific signaling pathways such as activation of EGFR and can thus facilitate high-content screening. Fabio Gasparri, Ph.D., principal research scientist at Nerviano Medical Sciences, stressed the importance of tending to basics. Nerviano conducts HCS assays to evaluate mechanisms of action of lead compounds affecting regulation of cell cycle or apoptosis. Cytostatic or cytotoxic effects are determined through specific marker assessments. For confounding compound classes, such as those inducing polynuclear formation or that increase cell volume, which in turn can affect monoparametric readouts such as ATP content, his lab applies alternative methods such as cell count to better determine the real effects of lead compounds. Dr. Gasparri’s lab currently conducts highcontent mechanism-based assays using the Thermo Fisher Scientific Cellomics ArrayScan HCS reader. Davide Danovi, M.D., Ph.D., research associate in Steven Pollard’s laboratory at the University College of London’s Cancer Institute, described approaches to carry out live image-based chemical screens using glioma stem cells. Pollard’s laboratory has developed a method to isolate cells from normal brain tissue and also from brain tumor (glioblastoma) samples. The cell culture protocol essentially involves defined medium with growth factors and the use of laminin, which avoids cell suspension (and thus the formation of neurospheres). “Neurospheres can be used for different applications, but we argue that if you want to screen for drugs to cure glioma, you need to test drugs on the relevant cell population, which is the stem cell-like population,” Dr. Danovi explained. Modules from various sources are used, including CyBio’s Cybi®-Selma liquid-handling device, an IncuCyte image-based platform from Essen BioScience, and Cell Profiler freeware from the Broad Institute. In-house bioinformatics efforts led by Amos Folarin allow “proper image analysis, so we can track cells, morphological changes, and mitoses, for example. Our approach uses proliferation as a readout to score compounds that are cytotoxic or cytostatic.” Among cytostatic compounds, those that induce terminal differentiation of glioma stem cells are considered for potential glioblastoma therapies. Eberhard Krausz, Ph.D., director for assay development and target validation at Janssen Research & Development (a division of Janssen Pharmaceutica), discussed two research tracks, one focused on protein-protein interactions and the other on the use of a 3-D co-culture assay for tumor microenvironment assessments. The kind of assay approach he described as “more accurate and increasingly important” is to monitor cell viability concurrently (not serially or in parallel) with target binding events. For instance, several current approaches for protein-protein interactions “show directly in cells how compounds penetrate, find the target, and interact with other targets,” he said. One particular approach Dr. Krausz presented is a high-content screen that anchors one of the two proteins under study, either in the nucleus or other specific locations such as at a particular DNA site. Janssen R&D has also developed a 3-D tumor-growth assay that “has certain advantages over 2-D classical cell-proliferation assays,” Dr. Krausz described. “We know from gene-expression studies that tumor cells under assay exhibit changed behavior in ways similar to tumors in human patients. Ideally then you would want to have tumor cells in co-culture that mimic the in vivo tumor microenvironment, which would then include normal, nontumor cells such as fibroblasts and other cell types. “Typically there are interactions between tumor cells and nontumor cells. Disruption of these interactions could allow us to exploit new options for targeted therapies that far exceed typical antiproliferative strategies,” he said. “A very important point with this assay is that we can discriminate between simple cytotoxic compounds and those that show promising potential mechanisms of action through our ability to count individual cells or colonies and discriminate according to colony size. Essentially we seed tumor cells along with primary mesenchymal stem cells in a matrix, treat them, incubate, and then count colonies. “Individual tumor cells will either divide to form minitumors or remain in the singlecell status. With noncytotoxic compounds, the total number of colonies does not change because the cells experience only growth inhibition,” which Dr. Krausz described as a particular strength of this assay approach. Dr. Krausz sees developments in live-cell assays, such as 3-D assays and co-culture, as having a “bright future on many fronts,” not only for disease areas but also in ADMET. Ideally, he posited, their utility would come with a drastic reduction in the number of compounds actually being screened but in more complex assay platforms.